The Road To Increased Comfort & Energy Savings Starts With You & Ends With Us! Perkins Inc. offers multiple services in energy conservation from energy audits and repairs and installs energy efficiency measures including cellulose and fiberglass attic insulation, insulation removal, spray foam insulation, replacement vinyl windows, spray on and foil radiant barrier, testing and repairs of air infiltration issues (weatherization) and duct integrity measurements (duct leaks). in homes to help identify opportunities for saving energy, money and the environment. We can provide single conservation measures or a complete home conservation service depending on your interest. Creating greener homes, increasing comfort and lowering energy bills are what we strive for at Perkins Inc. Don't let your hard-earned dollars slip through the cracks. Working with Perkins Inc. to perform and install energy saving measures throughout your home is the number one way to increase comfort and save money! Our customer service, satisfaction, low cost, and project quality are what make Perkins Inc. a strong competitor in the Dallas/Fort Worth Metroplex. Sign up or contact us today to schedule an energy assessment on your home and begin your journey on the road to saving energy, money, and the environment! Loans provided by EnerBank USA ( 1245 E. Brickyard Rd. Suite 640 Salt Lake City, UT 84106 ) on approved credit for a limited time. Repayment terms vary from 24 to 132 months. Interest waived if repaid in the agreed payment deferral period. 17.22% fixed APR, effective as of January 1, 2012, subject to change. Did you receive a NOTICE on your door? Did one of your friends or family tell you about the local electric delivery assisted energy conservation programs? See if you are eligible. 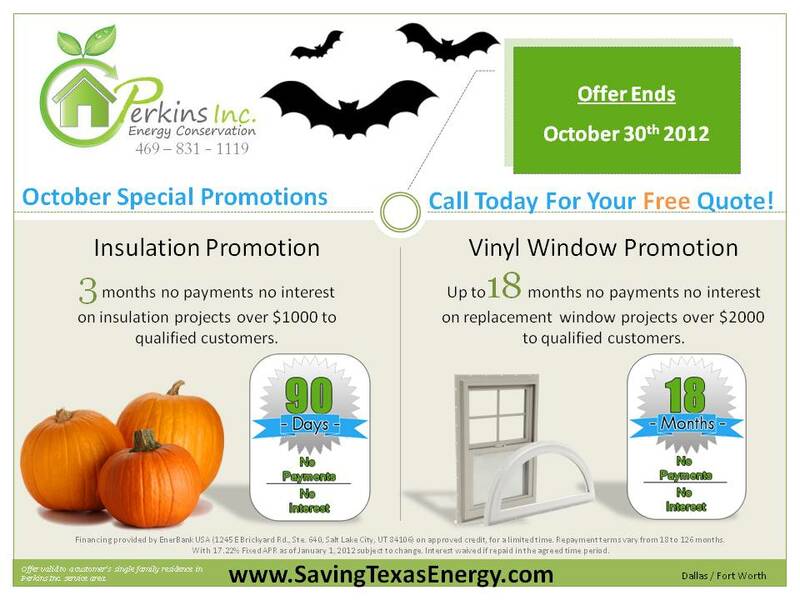 Perkins Inc. now offers 3, 6, and 12 months Same-As-Cash financing options to approved customers from EnerBank USA! ©2009 Perkins Inc. All Rights Reserved.